I have my very first solo photography exhibition running this month at the North York Central Library, 5120 Yonge St. entitled SLOW DOWN, LOOK CLOSER. Please check it out if you’re in the area and see Willowdale from a “bee’s eye view”. 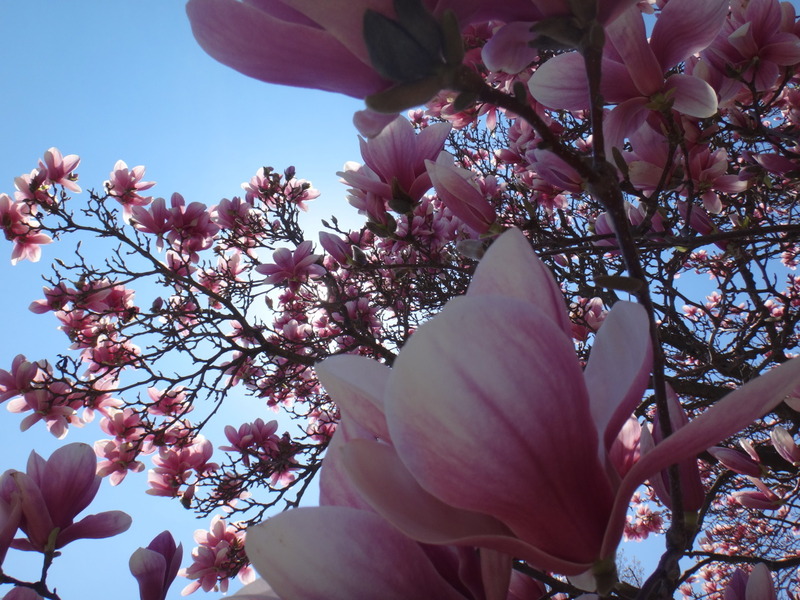 This entry was posted in Announcements, Art, Happenings, Projects and tagged art, events, gardening, nature, north york, photography, toronto public library, willowdale on March 14, 2016 by ChrisNolan.ca. The lyrics of Signs by Five Man Electrical Band always pop into my head when someone starts talking signs for safety: be they speed limit signs, stop signs, or shoes required signs. I do not support signs, and the neighbourhood is currently petitioning to get some new stop signs installed down the street, to convert a two-way stop to an All-Way stop, so here is my argument against this instance. As a “long haired freaky people“, it seems to be the minority view, but I think with a little bit of consideration and research, you may change your mind. First off, we are not traffic engineers. I don’t necessarily put faith in ‘experts’, but if you want to play the role of considering traffic flow, then consider traffic flow in the entire neighbourhood, not just at a single intersection. Changing an intersection will have impacts many intersections away in a variety of ways. What if your support for a change at this intersection, resulted in an accident nearby? NIMBY is a slippery slope to go down. All-way stops are put in place to assist with negotiating right of way, when the intersection has near-equal traffic in all directions. This intersection as one of its four directions is a dead end, you can assume right off the bat that it will not have equal traffic in all directions. Studies have also shown that drivers will increase their speed between intersections to make up for their ‘lost time’ of having stopped. Whoops? I don’t like pollution. Asking the majority of motorists approaching this intersection to increase their emissions and noise produced are two forms of pollution I’d rather keep out of the neighbourhood, not to mention the increased fuel consumption compounding over the next few decades that the sign would be there. Oil doesn’t grow on trees (anymore). If this isn’t obvious, when you accelerate from a stop, you use a lot more fuel, your engine is louder doing so, and when you are idle at the stop, and when you are accelerating there are many more emissions in the area. Risk compensation is a theory which suggests that people typically adjust their behavior in response to the perceived level of risk, becoming more careful where they sense greater risk and less careful if they feel more protected. Pedestrians and cyclists at the intersection could end up crossing in a more risky fashion, assuming the competition at the intersection will be stopping. Shared Space in urban design pushes this edge considerably and I lean towards this when ever I discuss traffic signs and road conditions with people. The attention this has gotten in the neighbourhood shouldn’t be ignored, but let’s not knee-jerk our support for the All-Way stop, but rather channel the concerns into looking at the larger issue of how can we make our community a better one for people traveling with-in it, and through it, on a larger scale. Please also consider how well you are perceiving the ‘danger’ here. Risk Perception is a funny thing. This entry was posted in Open Letters and tagged biking, community, north york, opinion, pedestrian, petition, safety, stop signs, toronto, traffic, ward 23, willowdale on January 31, 2015 by ChrisNolan.ca. LoveTheRavines has their Fall4Ravines photography exhibit on display at Patagonia Toronto (500 King St W) until the first week of December, and four of my photos are on display. Please take a few minutes to consider signing their petition to add the Don and the Humber Rivers to the Ontario Greenbelt. I wanted to give a shout out to the other photographers (in no particular order) who had their images selected. I look forward to meeting you Dec 3 at the evening reception at Patagonia. Nicole Czorny nczorny , Jacquelyn Sloane Siklos (ig: @sloanesiklos), Joanna Johnston (ig: @joannacjohnston), Sammy T (ig: @sammytangir), Ashley Therriault (ig: @ashtario), @lisarobertsonpics, Jonathan Scott Duder (ig: @jonathanduder ), Jeff Coussin: aka The Life & Adventures of Lenny Dawg (ig: @luciditydesign), Gabriel Bizeau-Régis (ig: @atroutatemyhomework), Gary Wallenwein ig: @totemblaze, Dan Berman ig: @scriptdr. Here is my collage of the images as arranged to match those hung and curated by Phil Anderson, Executive Director of Gallery 1313. I had excepted image titles and instagram ids at the exhibit, but there wasn’t any when I checked it out Nov 15 (update: the Official Facebook album had captions/titles for the images so I updated below (only 17 of the pics are there though)). I’ll included them as I searched around below. 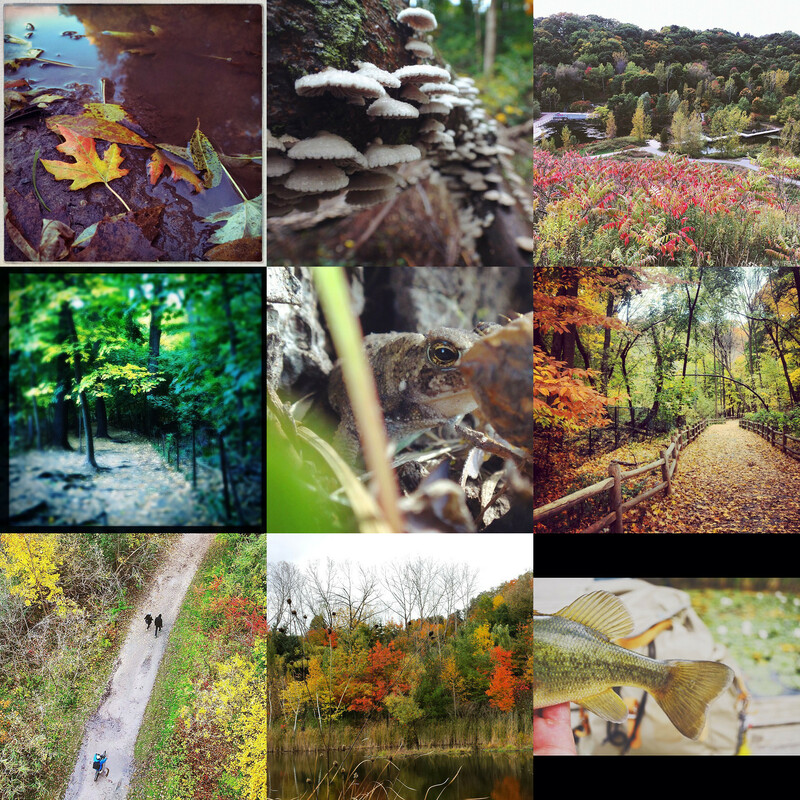 Here is a link to all the #Fall4Ravine tags on instagram via iconosquare. This entry was posted in Announcements, Happenings and tagged autumn, exhibition, Fall4Ravines, greenbelt, LoveTheRavines, ontario greenbelt, parkTO, patagonia, photography, toronto on November 17, 2014 by ChrisNolan.ca.